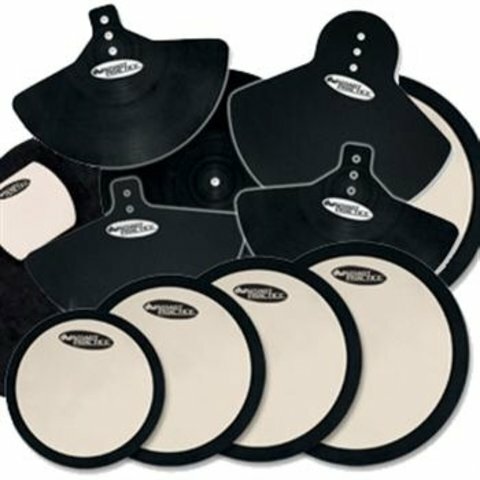 DeadHead™ Pads are specially made to provide natural feel and rebound without muffling the tone of the drums. This complete set has everything you need to quiet down a traditional 5-piece drum kit (3 toms, 1 snare, 1 bass drum, hi-hat, crash, ride). It includes SMPADHS4, CPPADBD, SMPADHU14 and SMPADCS5: The SMPADHS4 provides your tom deadening with 10", 12", 13", and 14" rubber pads on 1/2" base boards (all sizes also fit on next larger size drum). The CPPADBD takes care of 20", 22", and 24" bass drums and installs easily with 2 clamps (included). The SMPADCS5 includes 1 foam pad for 18" to 22" ride cymbals, 2 rubber pads for 14" to 18" crash cymbals and 1 foam pad for top and 1 rubber pad for between cymbals for 13" or 14" hi-hats.